Online Terms and Conditions - Eaton Drink Co.
ONLINE TERMS & CONDITIONS for TOBY EATON AND NICOLA COLLINS PARTNERSHIP T/A EATON DRINK CO.
You warrant to Eaton Drink Co. that, at the time of accessing Eaton Drink Co.’s Cocktail Mail page, you are 18 years or over. Eaton Drink Co. may request documentation from you verifying your age. If you refuse Eaton Drink Co.’s request or Eaton Drink Co. is otherwise unable to verify that you are 18 years or over, Eaton Drink Co. may cancel your order. If Eaton Drink Co. cancels your order, Eaton Drink Co. will not be liable to you for any reason. 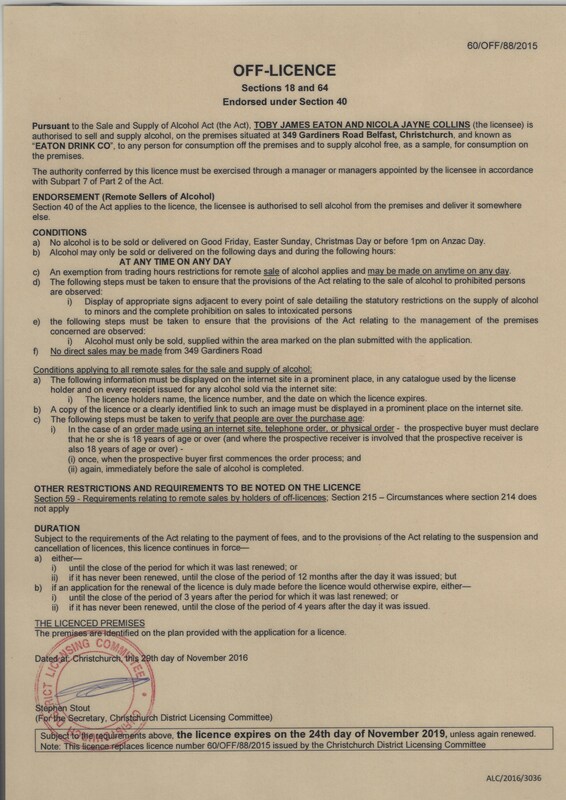 Eaton Drink Co. reserves the right to refuse registration of a potential customer on the basis of age or for any other reason. Eaton Drink Co. may also suspend or terminate any order for Products made by any person for any reason. Any shortages or breakages must be reported to Eaton Drink Co. within 24 hours of delivery, preferably by phone call. Please ensure to quote your receipt number at the time of reporting. Eaton Drink Co. will ensure every effort is made to fulfil any order, but you acknowledge that Eaton Drink Co. will not be liable to you if Eaton Drink Co. is unable to fulfil or rejects any order for any reason. Products advertised are subject to stock availability. Eaton Drink Co. will use its reasonable endeavours to prevent any unauthorised access to this site. Eaton Drink Co. will not be liable to you for any damage, loss or costs incurred by you resulting from any person gaining unauthorised access. Eaton Drink Co.’s online shop uses encryption protocol to encrypt and thus keep secure all personal data transmitted to and from this site (for example, credit card details). Eaton Drink Co. uses “Swipe HQ” to securely authorise credit card payments in real time. Once Swipe HQ receives your personal data, it stores that data on a secure server so that it can not be accessed by any person. The prices for Products will be the prices stated on this site at the time you submit your order. No upward or downward price adjustment will apply during the period from the time at which the order is submitted to completion of delivery of that order. Product prices may vary from time to time without notice and at Eaton Drink Co.’s discretion. You must pay for Products by credit card, or debit card Eaton Drink Co. will not accept any other method of payment. Eaton Drink Co. may change the payment method at any time and for any reason. Once payment of your order is processed and accepted by Eaton Drink Co. , Eaton Drink Co. will email you a GST receipt. All orders and Delivery times are Subject to availability first, Eaton Drink Co. is by no means contracted to or liable for Delivery times being longer than stated due to mitigating factors outside Eaton Drink Co.’s control. All deliveries within New Zealand will be by Courier and direct to your door (except in some rural situations). The Courier will require a signature by you or someone 18 years old or older upon delivery. If no one is home, the Courier will leave a card requesting that you contact the Courier office either to arrange a suitable delivery time or a suitable time for you to collect the Products from the Courier office. We can not leave packages without a signature of someone over the age of 18. Eaton Drink Co. reserves the right to withhold delivery of any order for such time and for any reason as Eaton Drink Co. may determine. Eaton Drink Co. is entitled to assume that any person accepting delivery of the products containing alcohol is authorised to do so by you and is at least 18 years old. Eaton Drink Co. (or any employee, contractor or agent of Eaton Drink Co.) will not be liable to you or any person for failing to deliver on a timely basis, whether the delay has been due to causes beyond the reasonable control of Eaton Drink Co. or otherwise. You must notify Eaton Drink Co. by email (hello@eatondrink.co) immediately or within 1 hour of placing the order to have the delivery address changed. Failure to do so within this time may result in delivery to the original desired address and Eaton Drink Co. will not or in anyway be liable. If you wish to change the location of your event we require at least 48 hours notice, changing locations may incur additional staffing or travel costs. All sales at the time of the transaction being processed are final, refunds will only be given at Eaton Drink Co.’s discretion. Eaton Drink Co. often purchases items from it’s suppliers immediately after receiving the order so we are not able to cancel. If any Product is delivered to you in a damaged or spoiled condition, or fails to be delivered due to damage. Eaton Drink Co. may (subject to Eaton Drink Co.’s agreement that such damage was caused by an act or omission by Eaton Drink Co. or the Courier) refund you the value of that Product determined as at the date of your relevant order or re-deliver that product. All breakage, Non Delivery or Lost Items must be brought to Eaton Drink Co.’s attention within 48hrs of the occurrence to remain a viable claim. Eaton Drink Co. is in no way Liable for replacement of the products if purchaser fails to Track the item and notify Eaton Drink Co. of any issues within this time frame. Upon signing up as a Member to Eaton Drink Co or Cocktail Mail you are hereby giving permission for us to send promotional emails to the designated email used upon entering your details, you must reply with the subject being Unsubscribe in order to notify us of your not wanting to receive any further emails. Eaton Drink Co. takes the protection of its copyright very seriously. If Eaton Drink Co. discovers that you have used its copyright materials in contravention of the license above, Eaton Drink Co. may bring legal proceedings against you seeking monetary damages and an injunction to stop you using those materials. You could also be ordered to pay legal costs.